Bicycle trailer for cargo with handcart function (accessory). ►Scope of delivery and prices may vary. The Croozer Cargo has been tested for everyday use to ensure that it will be a reliable companion for you on your adventures. For your gardening projects or a relaxing walk to the park with your picnic goodies: the Handcart Kit (accessory) offers great versatility! The user-friendly side-to-side folding mechanism lets you fold up your Cargo to a compact size in a matter of seconds. With its longitudinal bracing and riveted base, the sturdy cross frame ensures optimal load distribution. The integrated guards protect the wheels of your Croozer Cargo. Practical: they’re also ideal attachment sites for bike locks and can be used as handles for carrying the folded trailer. Our trailers are tested in accordance with the standards EN 15918 for bicycle trailers and EN 1888 for wheeled child conveyances. The universal hitch doesn’t fit to your bike? No problem – Croozer offers you a wide range of solutions for safely hitching your trailer. 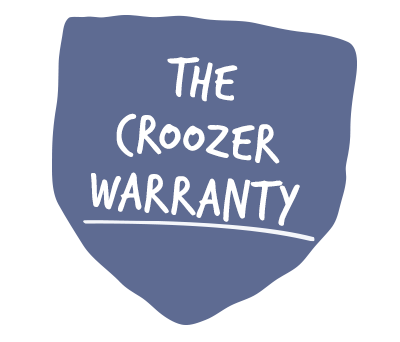 Our promise to you: 3-year warranty on your 2018 or newer Croozer bicycle trailer – 10-year warranty on the frame.